hi, my name is n----, and i am a drama-holic! it pains me to say it out loud, but i have started binge-watching K-dramas... and i like it. i am mostly drawn to the "historic" ones (there is even a special category for that), where they dress in old-timey clothes and blush profusely if anyone catches a glimpse of a woman's leg. it is like reading an extra-long historical romance novel—minus all the bodice ripping. plus, there are the occasional fight scenes. yep... i really like it! this is a new obsession, so i will refrain from passing criticism on specific titles. however, i have to say that i really really really enjoyed Sungkyunkwan Scandal, which served as my gateway drug. i have seen quite a few Korean period films (and by "quite a few", i mean like maybe ten or twelve), but this was my first foray into the world of Korean serial dramas. i am currently working on the third serial in this newfound obsession, though there is already a list of like thirty more titles i hope to eventually get to, and i definitely plan on watching that first one again. the one thing i must say about K-dramas—all two and a half of them that i have watched thus far—is that they really know how to write a bad guy. it is amazing how easily you find yourself spending twenty episodes with the phrase "i seriously hope that guy takes and arrow to the face" floating around inside your head. i do have to pause every now and then to try to figure out what is happening, but there are tons of websites for that sort of thing. yes, it is really hard to suddenly go from viewing the world through a prism of near-nihilistic pointlessness to being obsessed with television that seems to have been tailor-made for cheery fifteen year old girls, but i am willing to give it a try. 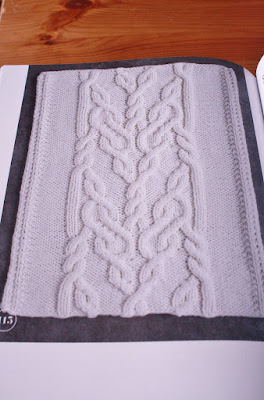 so, as i am already in the dangerous realm of fangirl behavior, it seems appropriate to (finally) elaborate on my fondness for knitwear designer Norah Gaughan (pronounced "gone"). 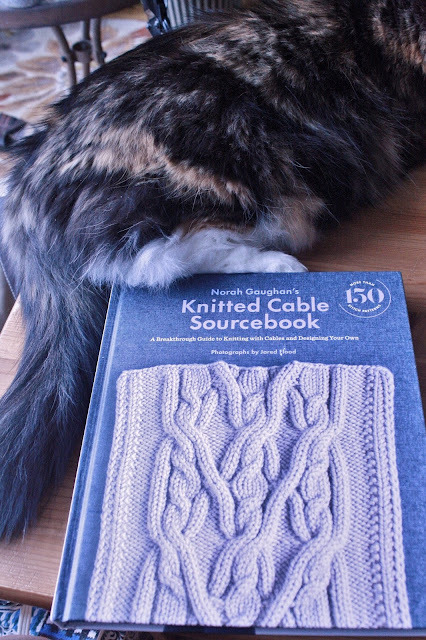 i pulled out the cable book again to talk a bit more about what draws me to her work. and, yes... that is the tail end of my calico cat. 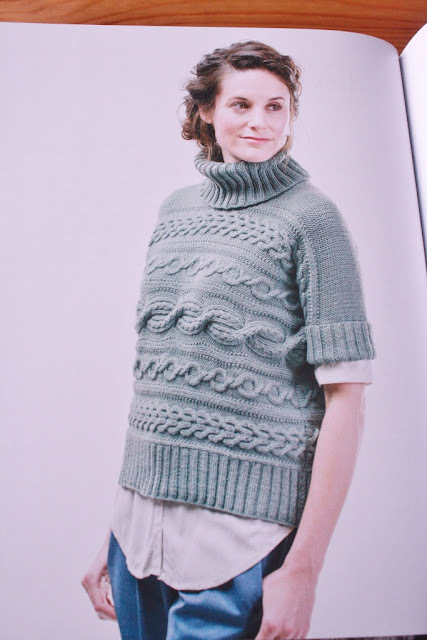 a bit of background: Norah is a veteran of the knitwear industry, and one of those people who can convincingy break all the rules, because she has already mastered them. she has a degree in Biology and Art, and her background influences her work. 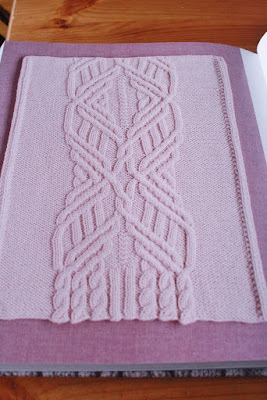 she is partial to fractals and other naturally-occurring shapes, and they tend to surface frequently in her designs. 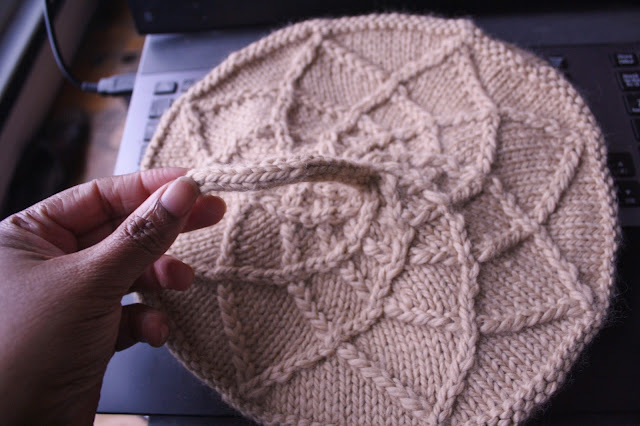 Norah is the genius behind the Sunflower Tam i mentioned some months ago, which is part of her book Knitting Nature, a collection that was inspired by... well... patterns in nature. 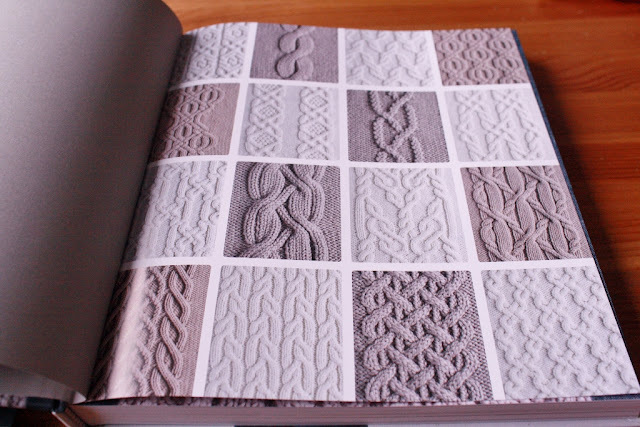 as the title suggests, the Knitted Cable Sourcebook is focused on the design and use of knitted cables. shocking, i know. then, as you are trying to get your eyes (and your mind) readjusted back to normal space, she throws something totally bonkers in your path, and you are left standing there, torn between intense curiosity and the very real fear that the universe just might collapse in on itself if you dare get too near. go on. be brave! if you have hung around this far, you are probably thinking, "they look lovely and complicated, but what am i supposed to make with such things"? the short answer is, "you make things". 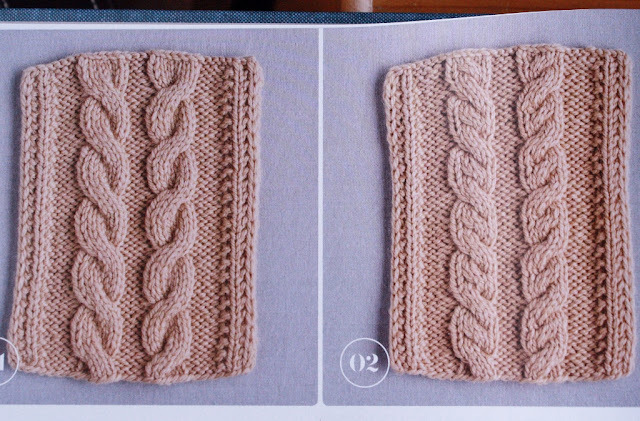 the book is an invaluable reference if you are looking to incorporate cables into a design (maybe add a bit of complexity to a boring item), but it also includes fifteen patterns by the woman herself... using her own crazy cables! that cable that looks like two strands of DNA caught in some sort of compromising position...? 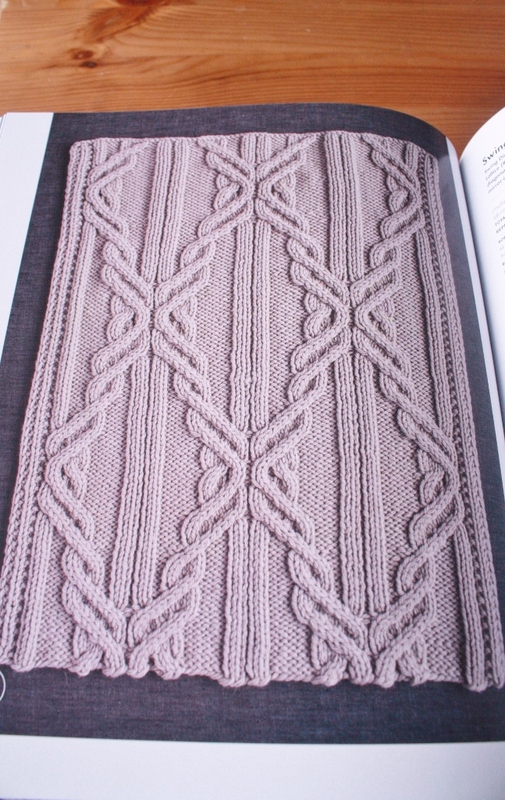 it makes for a lovely focal panel in a skirt that echoes the vertical ribbing in the overall design. 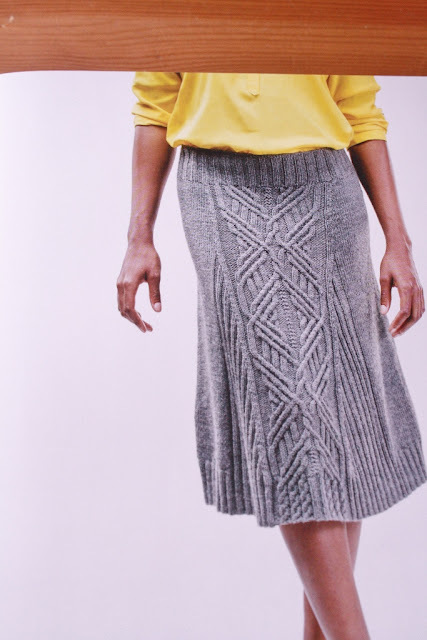 i can see my mom in this skirt. and the totally bonkers cable that looks like something from a remake of The Fly...? 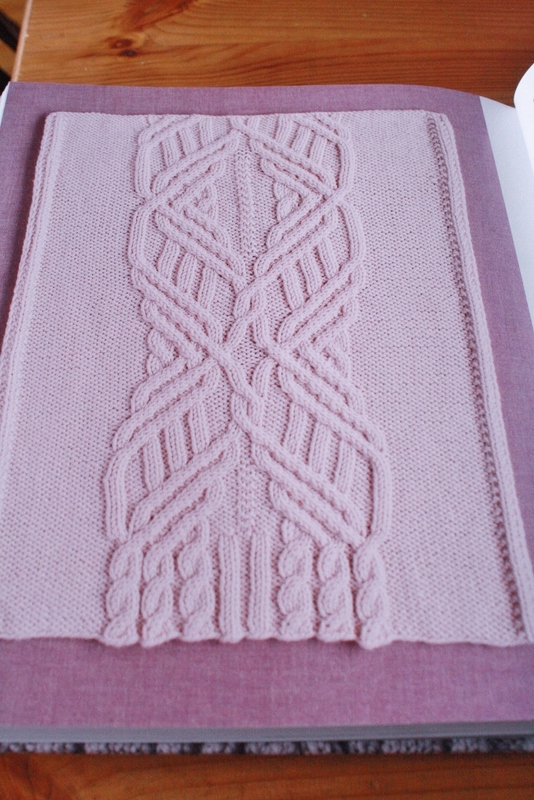 it is somewhere between lovely and divine on the front of this otherwise-unremarkable sweater. i feel like you are allowed to pop a bottle of champagne in celebration after you get through knitting this thing. ... and (my absolute favorite design from this book) the Chunky Cardigan. i want to make it a bit longer to double as a light coat in the not-quite-Winter parts of the year. check out the view from the back. i will need to clear all my chakras before tackling this one. despite my constant assertion that Norah is my favorite designer, it should be noted that i do not necessarily love (or even like) every single thing she creates. 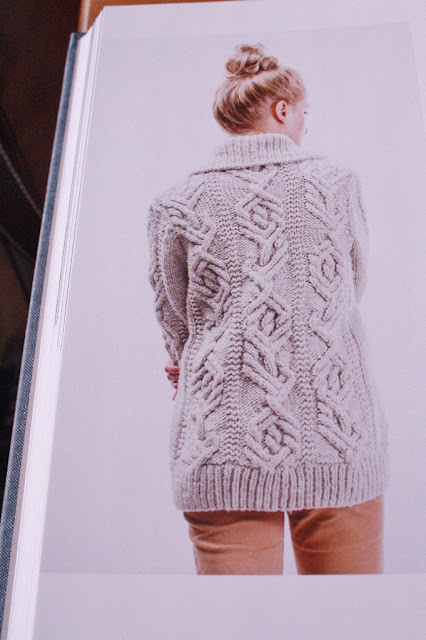 there are a few knitwear designers whose entire body of work fit more comfortably into what i would call my style, but the sameness of their patterns offers neither the imagination nor the challenge that comes from looking at a collection of Norah's designs. some of it jumps out as garments i need to make and wear right away, while others fall into the category of "interesting... for someone else's body" or (even better) "interesting... and with a few adjustments, i can bring this more in line with my style". that is when the imagination starts racing. 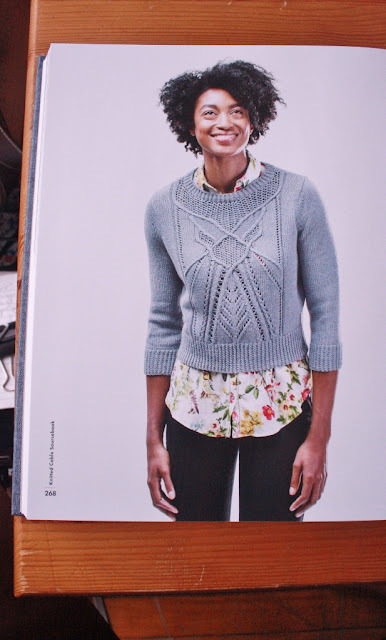 for example, she recently (as in, just a few days ago) released a collection of Summer patterns for fiber company Quince & Co called Framework. it should be noted that this release prompted me to (finally) sit down and try to put into words why it is that i so admire Norah's work. 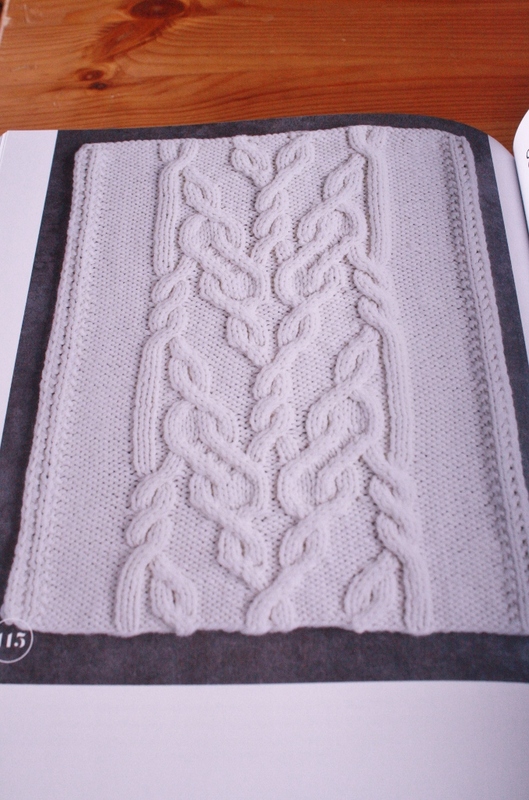 i instantly started a mental inventory of my stash in search of yarn to make the Walkway top, and i am deeply fascinated by the structural lines on Arris. the collection includes some items that i like... in theory. the gentle waist-shaping and shoulder design on Gambrel create a flattering line. however, i would first have to overcome my continued avoidance of anything that reminds me of shoulder pads or football gear before attempting that one. similarly, i really love the look of Annex. however, the lovely, structural features that give this design the "wow factor" would be like walking around with spotlights pointed at my hips. 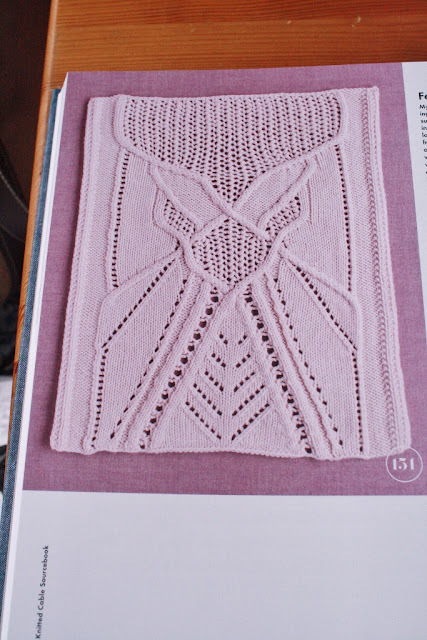 still, i seriously want to make that top. similarly, the Cable Sourcebook, contains a Batwing sweater that i would really like to make ... just as soon as i figure out how to get it de-batwingified. 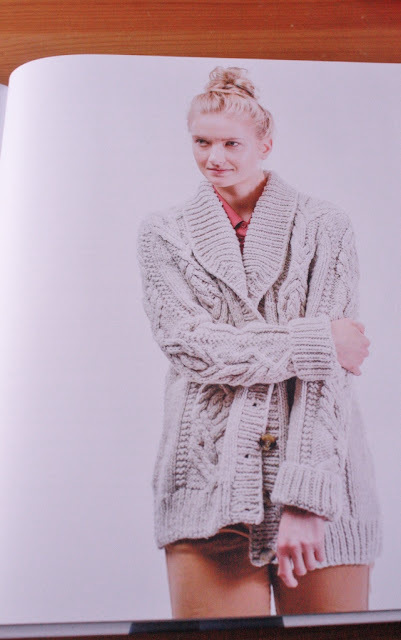 then there is the Flared Pullover, which screams "cozy sweater" in my mind. unfortunately, the back section would look like a collapsed tent draped across my railroad-caboose of a behind. still, i really want that sweater... once i figure out how to get it de-tentified. that is where the challenge comes in. overall, this little obsession of mine allows me to set goals for myself while doing something i genuinely enjoy, and to push myself to occasionally live up to even a small part of that challenge. and, if i occasionally come across someone like Norah who inspires me to grow a little more each day at something i love, then that is a wonderful thing.